Ministers with winners as below. Innovative Employment Practices Award: Presented by Tony Egan, AGMARDT. Employee Development Award: Presented by Ray Smith, MPI. Safe and Healthy Work Environment Award: Presented by Minister Nash. 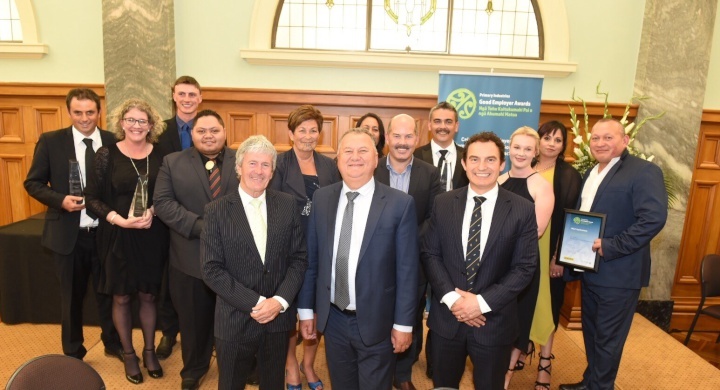 Māori Agribusiness Award: Presented by Minister Jones. Minister’s Award: Presented by Minister O’Connor. Minister of Agriculture Damien O’Connor has congratulated the best primary sector employers at an awards evening at Parliament. “The primary industries employ about 350,000 people – one in seven working New Zealanders and as many as one in three in some regions,” Damien O’Connor said. “Attracting and keeping this hard-working talent is a significant challenge and we recognise those exceptional employers who are committing to good employment practices such as training, paying and treating staff well. “I equally acknowledge those working throughout the sector who contribute to these sustainable, high-value business models. “Good employers help to attract and develop the skills we need for today and tomorrow. Investing in the workforce is critical to the future of our primary industries and a key part of this is providing attractive careers for the next generation of workers. “I had the pleasure of presenting the Minister’s Award to Ben and Nicky Allomes, the owners and directors of Hopelands Dairies Ltd in Woodville. “They have creatively solved the age-old problem of work-life balance by investing in a rostering system that allows their workers ownership of when they work and what they do on the ground. They have also shared this knowledge with their community. “The first ever MPI AGMARDT Primary Industries Good Employer Awards have recognised exceptional employers across the dairy, seafood, forestry and horticulture sectors,” Damien O’Connor said.